Photo by Mike Blair Prairie Dog State Park and Norton Wildlife Area are located around Keith Sebelius Reservoir. The lake is an impoundment of Prairie Dog Creek, which flows through the rolling mixed grass prairie of the High Plains. Drive south of the park office and over the railroad gorge to reach the sizable prairie dog town. The black-tailed prairie dog, named for its black-tipped tail and dog-like bark, uses mounds as sentinel stations from which to watch for predators such as coyotes, prairie falcons, golden eagles, and badgers. When the burrows are no longer used by the prairie dogs they are taken over by other animals including black widow spiders, ornate box turtles, gopher snakes, and the comical burrowing owl. If you drive along the lake roads during migrations you can expect to see a great variety of waterfowl and shorebirds. On occasion, a migrant osprey can be spotted fishing the waters. Ring-necked pheasants are abundant in the surrounding wildlife area, as are deer and wild turkeys. In early summer, reptiles, including six-lined racerunners, western hognose snakes, and plains garter snakes, can be found around the rocky ridges and open grasslands of the range management area. 58 utility campsites. Primitive camping allowed. 4 Cabins (make a reservation online). Branded Cedar Horse Trail, 7.5 miles; Prairie Dog Nature Trail, 1.4 miles. Click the icon to find a birding list for Norton County. Directions: From Norton (75 miles NW of Hays) travel 4 miles west on U.S. 36, then 1 mile south. Pick up your park permit, maps, and information on prairie dogs at the park office. For a Google Map of this site, click here. Ownership:The entities responsible for management of these areas are below. 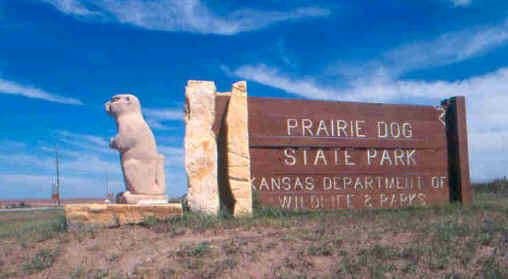 Click here to visit the KDWPT web page for Prairie Dog State Park. You may download the KDWPT brochures on Prairie Dog State Park and Norton Wildlife Area or email the Park Manager from the links at the top of that page.